Who do I contact if I have a concern about my child’s progress/behaviour? What is the school’s preferred method of contact if a child is sick? What should I do if my child is absent or late? How is the school organised into periods and breaks? How are pupils allocated to houses? What are the duties of the Head of House? There are senior managers who lead each house and usually it is a Depute Rector. In 5th year students are elected as House Captains, they lead various events throughout the year in the interhouse competitions including sports day. What is the official school uniform? P7 students will be given a folder with information on how to order their first school uniform and this will come via the primary school. Which items of clothing/jewellery are specifically not allowed in school? Modest jewellery allowed but must be removed at PE. No responsibility for losses can be taken but stolen goods must be taken up with the school via the office. How do I order extra items of school uniform? Ties are available to order via the school office at any time. What are the school’s policies? What are the procedures if the bus does not turn up or has been cancelled? Parents can choose to take their child to school in the event of bus cancellations and road conditions are safe to do so. However they will therefore be required to collect their child to return them home at the end of the day. 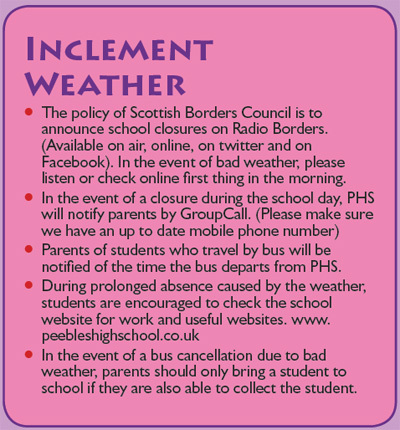 Parents will be notified via groupcall, twitter (see front page of school website if you are not a member to see live postings) and local radio on all information regarding school bus issues. Do I need to collect my child from school if the bus didn’t turn up? Who should I contact if my child lost/left something on the bus? Who should I contact about behaviour on the bus? What do I do if I wish my child to travel on another bus? Can children catch a bus after clubs finish? What does my child do in bad weather? What are the key holiday dates? How do I purchase tickets to school concerts, shows and so on? Tickets for events usually go on sale via the school office and occasionally one of the shops in the town will also sell them. An alert will come via email. When will I know if my child has a locker and how are they allocated? When is the library open for pupils? What trips may be available to my child throughout their 6 years at PHS? There are a variety of trips available throughout and vary per year but in the past there are several in s1 including an “all s1” residential and optional foreign trips. Later on school trips are offered in relation to specific subjects and also for sporting experiences. These are not guaranteed and you will get letters home via your child when they are offered. They are mainly funded by parents/carers. Places go quickly on popular trips, so pupils need to remain aware and respond quickly to announcements. Peebles High School places a very strong emphasis on the value of extra-curricular activities as a means of enriching the education of its pupils, particularly in developing social skills, self esteem, initiative and the ability to work as part of a team. In Peebles High School there are many opportunities for pupils to be involved in activities out with the timetabled school day. These may occur at lunchtime, at the end of the school day, or they may involve day visits or residential visits ranging from local to international scales. All extra curricular activities are provided by staff on a voluntary basis. What lunchtime and after-school clubs are available to my child? Who operates the facebook page for ‘PHS Parents’?